The photo above was taken at Mario Feir's residence in Makati City last September 2007. 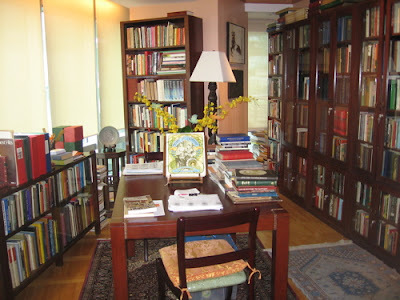 Mario had left a comment on my blog during the previous year, saying that he was retiring, going back to the Philippines with his books, and willing to open his library to researchers and bibliophiles by appointment. I had, of course, heard of book collectors, but one who actually went out of his way to invite people to use his collection was quite unusual. And so, of course, I made an appointment to visit when I returned to Manila last year, and found a Filipiniana collection that is more complete and better preserved than those in many public or academic libraries in the Philippines. The environment is much more comfortable, too. True, the books are neither cataloged nor arranged in a manner library users are accustomed to, but since the collection is relatively small and there is a certain order to the arrangement of the books, it is in fact possible to find specific titles. You can also just turn to Mario and he'll point you in the right direction. But what I liked most was the fact that I did not have to make any requests for books to be brought to me—which is what usually happens at most closed-stacks Filipiniana sections. Instead, I was free to examine and handle the books. Very few were the rare kind that crumble when you hold them; many were reprints because, as I understood it, the "collection policy" (though the term was not used) was to have a complete collection, and not necessarily to acquire first editions. Visit the website of Asian Rare Books for more information. And remember that you need to make an appointment ahead of time. Filipino Librarian: WikiPinoy of the Year? Thanks to Noemi, I learned almost two weeks ago that this blogger was cited in a list that accompanied an announcement regarding the WikiPinoy of the Year. Recognition is always good, but the reason it has taken me this long to write about it, aside from the fact that I've had a lot to do, is that I have mixed feelings about the "award." First of all, the announcement was made through a newspaper print ad (see Manila Bulletin, 6 January 2008), with no corresponding page online until much later. I find it strange that an online entity like WikiPilipinas would choose to honor Filipino bloggers, who are known for writing online, through an offline ad. It doesn't compute. Second, the citation begins with the following: "WikiPilipinas honors the Filipino Blogger in 2007," and ends with a list with the names of 3 bloggers and 7 blogs whose owners went unnamed. It's possible that those on the list were intended to represent "the Filipino Blogger," who must number in the tens of thousands by now, but no such explanation is made, and neither is the selection process spelled out. Who was eligible? Who made the decisions? Third, this blog has always been known as "Filipino Librarian," and so I wonder why it is listed as "The" Filipino Librarian. It's flattering, of course, to be thought of as "the" whatever, but I'm the kind of person who is wary of people who make mistakes about simple but very fundamental things. It makes me wonder, "What else did they get wrong?" But more important than this is the fact that the category I'm in is "Communities." What does that mean? As I commented on Noemi's blog: "what did i do to be classified under 'communities'?" This post is a pseudo-review of what I've written about during the past year. It's not really about me, but for the benefit of those who are new to the blog, I should probably say that I was in Manila (see "Home") from August to December 2007, but am now back in Toronto, where I am studying for my PhD. What follows is not exactly the "first paragraph/sentence" of each post... but it's probably better this way. Interestingly, the posts seem to be fairly representative of what this blog is all about. From The Anglophile's Rest via RSS feed to p. manalo: "Go to your Calendar and find the first entry for each month of 2006 (not including memes of course). Post the first paragraph/sentence of it in your journal, and that's your 'Year in Review'." Cory Doctorow was introduced as an editor of Boing Boing, a science fiction novelist whose works can be downloaded via Craphound.com and is one of Forbes.com's Web Celeb 25. Chapters Indigo is a Canadian bookstore, but believe it or not, I found out about the advertisement above through Filipino bloggers Gelo and Tobie. April: Gmail Paper... Happy April Fools' Day! If Gmail Paper sounds too good—and outlandish—to be true, then it probably is. The gains made last March by the Top 50 Pinoy Top Blogs (PTB) were sustained in April. Do you remember why you became a librarian? Or how you got your first job as one? Two books were printed in the Philippines in 1593, but it is unclear which one was printed first. Supposedly, Filipino is the national language of the Philippines, but if you speak a language spoken in the Philippines other than Tagalog, you are probably unlikely to accept that Filipino (the language) is Tagalog (and it's not). The photos above are of the package I was given by Yna Reyes, publication director of OMF Literature. The Carnival of the Infosciences (COTI) crossed the Pacific Ocean recently and is now up Down Under at Connecting Librarian. On October 15, the Carnival moves to this blog, and I will try to give our foreign guests a taste of Filipino hospitality. From "Storytellers reach, touch hearts of kids" by Ma. Cecilia Rodriguez (Philippine Daily Inquirer, 4 November 2007): "'We are still trying to solicit more (reading materials),' librarian Arlene de Guma said." The author (left), the first Filipino librarian to become an IFLA/OCLC fellow, shares her reflections on her experience.